Fun fact about Puerto Rico: Over three-fourths of the USA’s rum supply is produced on this tiny, humid island. So it should come as no surprise that one of the top attractions in the San Juan area is Casa Bacardí, where one of the world’s most beloved rums is distilled and produced. As rum lovers, my husband and I couldn’t resist the chance to visit the grounds of a rum distillery (especially when a complimentary welcome drink is included in every tour, hello). 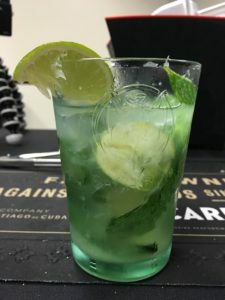 We did our research and opted for the Mixology Tour, which gives visitors the chance to learn how to prepare the three most popular rum concoctions: a Cuba Libre, a daiquirí (not the frozen kind! ), and–my personal favorite–a mojito. We chose this tour over the Historical Tour (which is cheaper, but less interactive) and the Rum Tasting Tour because we felt it provided the most bang for our buck: you get to consume the three beverages that you create! Upon completing our tour, I had different thoughts, which I discuss in this post. I’ve written up a summary of our experience and some tips I wish I had known, so keep reading if you’re thinking about visiting Casa Bacardí for yourself! Getting There: From Old San Juan, take the ferry over to Cataño for $1 roundtrip (per person). The ferry can be found at the port on Calle Marina; go into the red and gray building on the water and find the kiosk where an agent is selling tickets. (The building is across from a CVS and when you enter, there should be a Subway on your right.) The ferry leaves every 30 minutes but isn’t very timely, so arrive with more time than you think you’ll need. The ride over is about 15 minutes. Once you arrive in Cataño, there will be vans and taxis waiting to drive you the 10 or so minutes to Casa Bacardí for $6 roundtrip (per person). Side Note: The Casa Bacardí website says to arrive 45 minutes prior to your tour in order to fully enjoy the premises. We may have missed something, but I’m not entirely convinced that such a long window is necessary since there are no buildings nearby to check out; that recommendation seems more like a way to get visitors to hang around the welcome bar waiting for their tour to begin, developing a thirst for more (non-complimentary) drinks. But hey, you’re being encouraged to drink rum at all hours of the day, so who’s complaining? Duration: The Mixology Tour lasted about an hour and a half, so with travel time and everything, I’d say to allow for about two and a half to three hours for the entire Casa Bacardí experience (assuming you don’t miss the ferry over, like we did). The Tour: I was disappointed in the “touring” portion because it’s basically just a tram ride around the grounds, not an in-depth look into the workings of a distillery. Your assigned guide (or Brand Master, as they’re called) drives you around and tells you about the history of Bacardí, and you make two stops, both of which are clearly designated tourist spots. In other words, you don’t venture too far in to the factory; instead, you’re brought to spaces that seem to have been built for large groups, featuring large displays that teach about the rum-making process but no real “behind-the-scenes” feel. Becoming A Mixologist: This part of the tour was also a bit underwhelming, but still enjoyable. 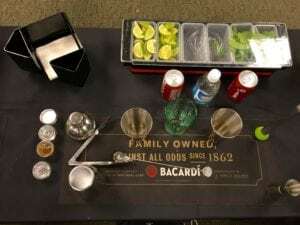 Your group is brought into a large, bland room where tables are set up and equipped with all your mixology needs–glasses, a shaker, a meddler, the ingredients, etc. (No, you don’t get to pour your own alcohol; the shots are pre-measured into little cups!) You are led step by step through the process of creating a Cuba Libre, a daiquirí, and a mojito. In my opinion, the mojito was the only one that felt like it required even the slightest bit of skill. The other two drinks were really simple to make and I didn’t feel like I learned much. However, all three were delicious, and you will leave with a buzz. Have you visited Casa Bacardí or gone on a similar tour? If so, share your experience in the comments! I’d love to hear your thoughts and tips.